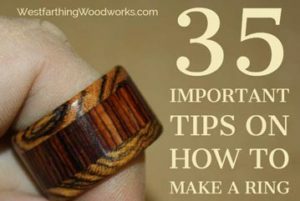 Here are 35 important tips on how to make a ring. Wooden rings are very popular, and they are also easy to make. Follow these tips, and you can be sure to have a fun experience, and a great time making a ring. Making rings is a great beginning level woodworking project. It is easy to pick up, and easy to start because it does not require a lot of tools. Like any other new project, you can really benefit from learning some tips early on, and they can help you make better rings. Wooden rings are made from wood, no kidding. So, the more you know about wood, and the different types that are available in the world, the better. The amount of expressions that you will be capable of will increase dramatically if you learn more about wood. Start by looking online. 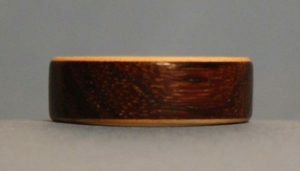 There are numerous websites that are all dedicated to teaching you about different wood species. After that, go into a local woodworking store or hardwood store. Take a look around, and get to know the different types of wood that they carry. Over time, you will develop a list of favorites, and they will become signature looks for your rings. If you want a little head start, my 7 Beautiful Types of Wood for Ring Making is a good place to begin. If you are brand new to woodworking, you will be amazed at the types of wood that are available in the world. Invest some time learning, and you will be able to create more beautiful and interesting looks than other ring makers. The world is full of retailers, and you have so many choices for making a ring. There are local stores, and there are online stores, all of which are eager to sell you materials for your wooden rings. I recommend that you incorporate both into your process, because they both can give you value. A walk-in store gives you an opportunity to touch and feel the materials before you take them home. This is not possible online. An online store will typically carry a deeper and more exotic line, which benefits you because you now have access to those materials. When you combine the two places, you get the best of both as you buy wood for your wooden tings. When you make a ring, you are not restricted to just wood. There are a number of great materials that can be used with wood, or by themselves. Plastic, acrylic, bone, resin, and many other materials await your discovery, and all you have to do is look. Acrylic comes in a number of different looks and colors, and you can get the material for a very low price. It looks great with wood as a counterpart, and glues together really well in a lamination. It can be found locally or online. Bone, shell, rock, and even cloth material can all be used on a ring. Don’t think that you are stuck with wood alone. When you combine these non-wood materials with wood, you can really make some interesting and amazing looks. 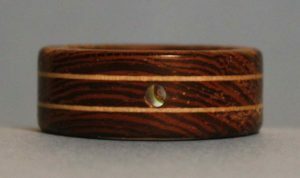 If you want a great place to find materials for making rings, check out a wood turning store online or in person. 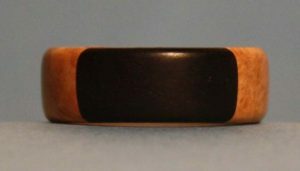 These stores sell items for the lathe community, but even if you are not making your rings on a lathe, you can benefit from the materials they sell. 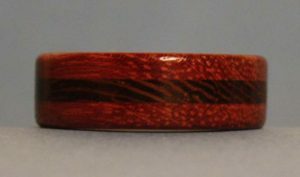 Lathe turners love exotic materials, and the stores that serve them stock it well. These places are great for discovering new materials, and seeing what creative and talented people are using to make their projects. Look online first. Find a good online turning store like Penn State Industries, and take a look at what they have to offer. Their selection of materials is amazing, and you can bring home something that will make your wooden rings truly shine. If you do not have a lot of tools, then you need to buy wood according to the tools that you have to work with. When you make a ring, you need thin pieces of wood that you glue together into a stack. If you can’t make thin pieces like this, just buy them. In higher end woodworking stores and wood stores, you can find a section where they have thinner stock. These pieces range in thickness from less than 1/8 inch to around 1/2 inch, and they come in many different species. Rummage through this section and pick out several boards that range in thickness. They are going to be a little more expensive than common boards, but they have already been milled for you. This is where the price difference comes in. You save money by not buying the tools, but you spend a little more on the finished wood. If you have a lot of tools, and you are not a beginner, then you are in luck. You can save a lot of money by milling your wood into thin strips yourself. Simply select the pieces that you want to use, and then start turning them into strips. Cut the thicker pieces into thinner pieces on the table saw or band saw. Than, run them through a thickness planer. Keep on making passes with them until they are smooth on both faces, and repeat this for all the types of wood that you want to use. When you are done, organize your strips by species or color, and you will have a good pile to work with. It does require some effort to mill all of this wood, but in the end you are rewarded with a less expensive project, because you own the tools. If you want to learn about making rings, simply find people online that already make rings and follow them. 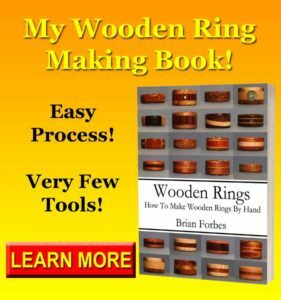 This will keep you supplied with a ton of great wooden ring making information, and lots of inspirational pictures. 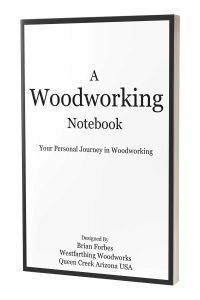 I wrote a whole post on 11 Great Ways to Find Woodworking Inspiration, and the methods can help you find the motivation you need. It can also show you what people are making, and the tools they use along the way. After you spend a while looking at all of this information, you will have a much better understanding of the process, and materials. You will also know what a good looking ring looks like, so you will be more able to hit that target when you make your own. The beauty of using thin strips is laminating them together. This is where you can take a few pieces of good looking wood, and turn them into one solid piece of amazing looking wood. The only thing you have to do is play around with the look. Since wood comes in tons of different colors, you really have an almost never ending amount of combinations you can make. Most are layered with three pieces, but you can do more or less if you want, and that changes the look. Play around with contrasting colors of wood, and make up some practice blanks. Don’t glue them yet, just play around with the looks. Arrange your pieces several different ways, and decide what combinations are going to give you the best look. To see this process in action, you can read about my Laminated Wood Ring. As you layer your ring blanks, don’t forget that you can use different thicknesses of material to help vary the look even more. The color, and now the thickness of the material will help you create gorgeous rings. One of the most common is to use a thicker piece in the middle, and then a couple thinner pieces on the faces. This allows you to showcase a single species of wood in the middle, and then face it with another species. Since the eyes are drawn to the middle, the main species becomes the star, and the smaller pieces become accent colors. 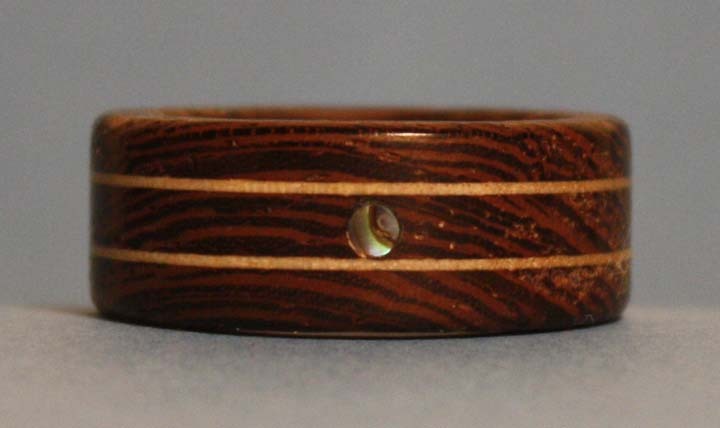 You can highlight the center through contrast, and make a bold ring with only two types of wood. 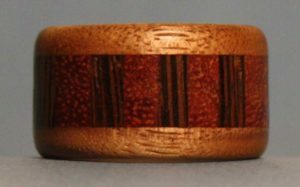 I wrote about using veneer in 9 Ways to Make a Better Wooden Ring, and you will love working with this product. Wood veneer is a thin piece of wood, that is so thin it is flexible and paper-like. 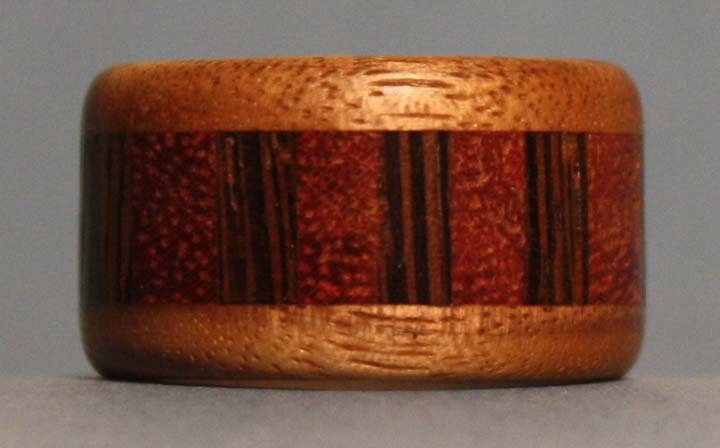 This is how you make thin lines of color in a wooden ring. Veneer comes in nearly every species, and you can find it in a woodworking store. I recommend buying a variety pack or wood identification pack to get the most colors and most sheets for your money. 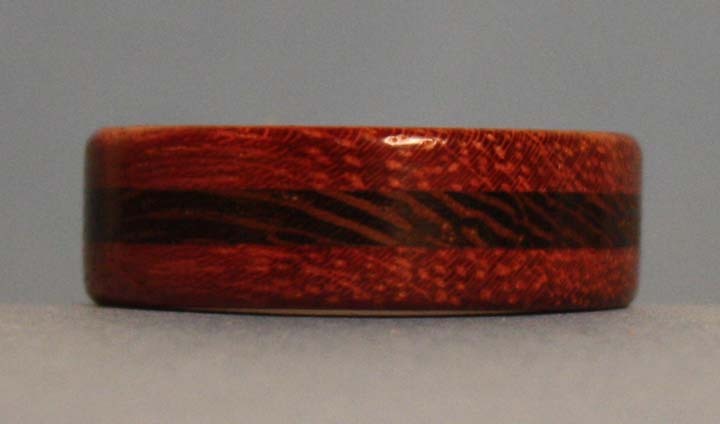 Veneer goes a long way, so even a smaller packet will give you enough material to make several rings. Keep a scissors handy, because that is the easiest way to cut veneer. A hobby knife works well too, and the material cuts very easily. Fix your problems before they become glue covered problems is a post that I wrote about taking your time and test fitting your glue joints. The same hold true for making wooden rings. If you test first, you will identify problems before they are covered in glue and harder to fix. The biggest thing that you need to avoid is gluing your blanks together with debris in between them, or with a poor fit. The whole design of the ring is based on the look of the pieces of wood glued together. Gaps in that look will make the ring look poorly made. When you bring your pieces together, clamp them, and then look for gaps. Sometimes, a gap is caused by debris. In that case, clean the surfaces. Other times. it’s caused buy a bad cut or a wavy piece of wood. In that case, flatten the piece, or get a new piece. The more you can do to make your blanks look good, the better. Do your best to eliminate all gaps before you add the glue, and you will have a much easier time. Once you are satisfied, you can start gluing without having to worry about the blank as much. 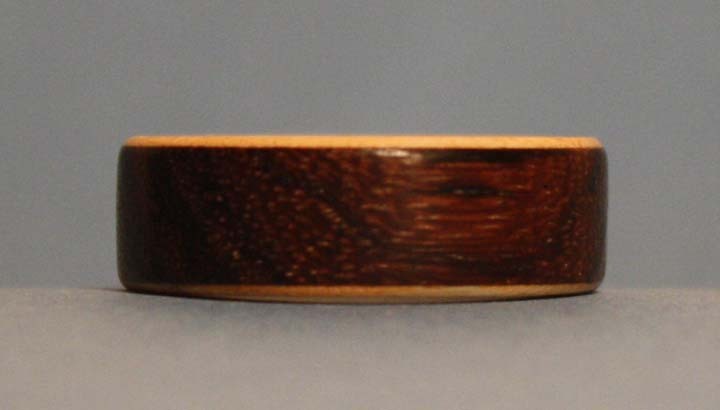 One of the main problems that laminated rings face is breaking along the grain. A piece of wood breaks with the grain very easily, and if you do nothing about it, your rings will suffer the same fate. Thankfully, it’s easy to prevent failure along the grain. When you glue up your pieces, look at the way the grain runs. It’s important that you do not glue the pieces together so that the grain is running in the same direction. Instead, make sure that each layer is perpendicular to the last. Start with your bottom piece. If the grain on that piece is going left to right, make the next piece go up and down. After that, you need another left and right piece. Keep alternating the grain like this until you have your blank all stacked up. Now, all you need to do is remember to keep it in order. The gluing stage can be a little hectic, especially if you went nuts and created a blank with a dozen layers. Make sure to keep the layers in order, and the grain direction as well, otherwise you can be risking failure along the grain. You would not believe how many times I hear about people spending a few pennies less to buy cheap wood glue. The glue that you use is going to hold all of your projects together for the rest of your life. When you think about it like that, isn’t your project worth a few more pennies over the course of a lifetime? Wood glue is not that much more expensive in the name brand. Buy a good glue, and keep it from freezing or getting too hot. If you can keep it in the house, that’s a good place because it remains at an even temperature. When you use a good glue, you reduce your worry because you can be certain that the glue will not fail you down the road. You already have enough to worry about, so don’t create decades worth of anxiety over buying glue that is a dollar less. If you still want to be frugal, How to Save Money on Wood Glue is a good read, and this is the only way to cut the price down without sacrificing quality. Several of the most beautiful woods in the world are also the most oily. The Rosewoods are commonly oily, and they can be difficult to glue. Thankfully, you can do something to fix the problem and ensure a good glue joint. The oils on the surface are the problem. These interfere with glue penetrating the wood, and therefore prevent a good bond. You need to get rid of these first, and then you can safely glue your pieces together. A solvent like denatured alcohol or acetone is the perfect way to remove these oils. Simply dampen a rag, and wipe the surface. Keep on doing this until the rag comes off clean, and you will have removed the oils from the top of the wood. Now, dry the wood, which will be quick because the solvent evaporate rapidly. Then, glue your pieces together quickly. The point of the process is to get the pieces together long before the oils have time to come back out. Work with a purpose and you will be fine. When you are gluing materials other than wood together, wood glue will not work in most cases. Wood glue is best for wood to wood joints, but there is another product that is great for all of your other joints. Two part epoxy is a reaction based adhesive that works by combining two chemicals that cure together into one. Place this between two surfaces, and after the epoxy cures, the bond is incredibly strong. You can read more about using Epoxy in Woodworking, and get to know this product because you will be using it often. Epoxy works on just about any material, including wood. If you are gluing several layers together, wood and non-wood, just use epoxy for the whole stack. After it has cured, the pieces will be held together permanently. Look for a 5 minute and a 60 minute epoxy. Buy a name brand, and you will have much better results. The minutes refer to the amount of open time before the epoxy hardens and can’t be moved around. The 5 is good for small jobs, and the 60 for when you need more time to get everything together. So many times woodworkers make small blanks for their rings. If you are going to go through the trouble of making a blank, and laminating all the pieces together, just make a bigger blank. This is not only better for production time, but it’s safer too. A larger blank means more rings from that same blank. Why not get more rings when it will take you about the same time to make the blank anyway? This is common sense, and something that you should start doing right away to increase your productivity. Another thing that a bigger blank does is make you safer. You will have more room to clamp down the blank while you are drilling, and this will mean a safer process. You risk your fingers less, and will have a better and healthier time making wooden rings. If you can, you should always use a drill press for the finger opening. A drill press makes a straight hole every time, and is easier to use. Also, a drill press can allow you clamping options that a hand drill does not. A drill press is designed for drilling perpendicular holes. It’s also designed to turn larger bits, with more force than a hand drill. The Forstner bits used in making rings take a little effort to drive, and the drill press does this very well. If you do not own a drill press, you might know someone that does. It can be useful to make an appointment to head over to see them, and drill all of your blanks while you are there. It will only take a few minutes, and the results will be worth the time. You can’t hold the blank and drill it at the same time. You can at first, but when the drill catches, you are not strong enough to hold it still, and not fast enough to get your hand out of the way. It will hurt, and you only have yourself to blame. I already covered this in Clamping and Drilling, but it’s important to talk about again. Instead of taking chances, clamp your blank to the drill press table or to the bench top when drilling by hand. This frees up your hands to operate the tools, and keeps you far out of the way if something were to go wrong. This is also a good way to get a more accurate hole without a drill press. Clamp the piece down, and then you have your whole body free to align the drill really well. When you feel like you are really straight, you can start drilling with more confidence. Of all the kinds of drill bits that are available, nothing beats a Forstner bit for making clean sides, and a perfectly sized hole. They are available everywhere, as well as online, and they come in fractional sizes for making accurate holes. Twist bits are the most common of all drills. They are the ones that you see everywhere, and they are unfortunately the most lazy tool you will ever meet. A twist bit will literally bend on the surface, and find a soft spot rather than going where you want it to go. This is the problem with that kind of bit. A Forstner bit on the other hand has a center spur that bites, and creates a starting path. This guides the bit right into the surface, exactly where you want it to go. The back side of the ring can be damaged severely if the exiting drill bit blows out the material. This means a wasted blank in most cases, because the damage cannot be sanded out or removed with a file. To prevent this, simply use a piece of scrap under the blank. Pine is perfect for this, but you can use any species that you have in the shop. Clamp the blank and the scrap to the table top or bench top, with the scrap on the bottom, then drill. When the drill exits the blank, it goes right into the scrap. There is pressure between the two pieces, so there is no blow out. The ring looks better on both sides, and the sanding and shaping process later on are that much easier. I created a Ring Sizing Chart that will help you drill your rings better. It has a section where you can pick out the right drill size based on the ring size. If you are close, grab the size smaller, and you can sand the hole wider for a perfect fit. Of all the reasons that someone stops wearing a ring, the size is number one. A ring that fits poorly is not a pleasure to wear. This can be something that is too tight, or something that is too loose. The fit is very important, because no matter how beautiful your ring, the owner will not wear it if the fit is poor. Use the chart from my other post, and you will be able to make a very accurate hole for a perfect fit. The people that you give rings to will wear them more often, and hopefully tell more people who made it for them. Most of the time, the Forstner bit makes such a great surface that you can forget that you need to sand inside the ring. Even with the smooth surface left by the bit, you still need to get inside there with sandpaper to clean it up. Start with 220 or 320 grit paper, depending on how smooth the surface already is. Break the inside edges with the paper, just taking away the sharpness. The edges of the circle can be pretty sharp, and that is not comfortable at all for a ring. Once you break the edges, focus inside the opening, Wrap the sandpaper around your first finger, and sand inside the ring. This part of the process should not take long, since the Forstner bits cut so clean, but it goes a long way to make the ring feel more comfortable. If you need to remove a lot of material from inside the ring you can use a Dremel tool. I rarely use this method, because I have eventually collected enough drills to get really close. However, you may find that you need to remove a lot of material, and the Dremel is perfect for that. Pick up a set of the small sanding drums that go into the Dremel, and those are great for opening up the ring. Sand carefully and slowly. The Dremel tool removes material quickly, and you can take too much if you are not careful. Switch to finer grits and smooth out the interior surface after you get to final size, and then you can sand by hand in the end. The goal is to have a good fit and a smooth surface inside the finger opening. Once you accomplish that, you are done with the inside of the ring. One of the most popular styles of ring is called a comfort fit. This is where the inside of the ring is beveled or rounded so that there is less contact. In this kind of ring, only the very middle of the finger opening is the drill diameter. The outside faces are rounded over, and it has an interesting effect on the feel. A comfort fit ring will actually feel looser than a normal cut. This is because there is less material in contact with your finger. The comfort fit solution is great for when you have a ring that just needs a little goose to be a perfect fit, and is a bit too tight. Sanding away some of the edges inside the ring opening create a smaller surface area in contact with the finger, and give the ring a bigger feeling. If you are sizing for a comfort fit right from the start, shoot for half a size smaller than their actual ring size. After drilling and taking care of the finger opening, your blank is still very large. It should look something like a square or rectangle with a hole in the middle. In order to minimize the amount of work later in the process, it’s time to trim the fat. Use a hand saw or band saw to cut out the rough shape of the ring. This can be as simple as hacking off the corners, or as detailed as cutting out the rough shape on a band saw, getting as close as you can to final size. The more you can remove before sanding, the better. Sanding wood is a time consuming process. Get your ring into great shape before you head into the sanding phase, and you will have a much easier time. A much shorter time too. One of the best tools in the shop for shaping the ring is the belt sander. This tool removes material quickly, and can help you get your rings into sanding shape. A small belt sander is all you need, and the process is quick. Put the ring on the table top of the belt sander, either on the belt or the disc. Then, bring it into contact with the belt while rotating the blank. Touch lightly, and keep the ring moving all the time. As you do this, you will remove material, and create a rounded shape. Once you remove the excess, mark a ring around the center opening that is about the same as final thickness of your ring. Repeat the process and sand to that mark, all the way around the ring. Once you do this process on the belt sander, you will never want to do it any other way. The ring is a great place to show off a little inlay work. 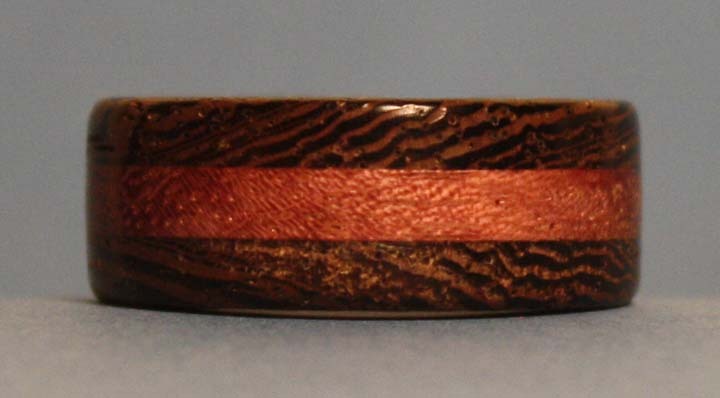 If you are comfortable with the skill, a simple inlay can set off a ring nicely. Look for simple inlays, that are easy to execute, and small enough to fit on the ring. One of the easiest inlay methods is to use epoxy. In that easy method, the easiest version is to use Inlace, which I explain more about in Inlace for Easy Wood Inlays. Essentially, the process involves drilling a hole or making an opening, and then filling it with epoxy. After the epoxy cures, you sand the surface level, and you have an easy inlay. You can add more if you like, in different colors, or create a custom design. Either way, the process is the same. Create the opening, fill it, sand it, and you are done. Super easy. Sanding is already a chore. It’s even more so when you do it wrong. Sanding can be made to be as easy as possible if you just learn your grits, and change them as often as you need to get to the final smoothness. Coming off the belt sander, pick the grit that is the the most aggressive that you can, but not more than the marks that are already on the ring. Use it, and once the ring cannot be improved with that grit, change to a finer grit. Repeat this process over and over again. Switching grits as soon as you can no longer make the surface any better. Working this way, you can move all the way through 320 grit quickly, and end up with a ring that is very smooth. Thin rings are popular, but they are also more fragile. Metal rings have a benefit of being made from…metal. That is a much strong medium, and that it helps a lot when you make a ring that is very thin. For wooden rings, you can go thin, but be careful that you don’t go too thin. The thinner the ring, the easier it will be to break. If you wear a right hand ring, and shake hands with someone, a thin ring can break much faster than a thicker ring. Shoot for about 1/8 inch at the minimum for your ring thickness. This is a good size for strength, but also a good size for comfort. If you go thinner, you just need to be careful how you handle the ring, and who you allow to shake your hand. For more about ring properties, take a look at How Durable are Wooden Rings. It’s important that you know the way wooden rings work, so you can explain it when you are asked by either friends or customers. One way to make a thinner ring stronger is to make the ring longer. An extra layer of wood can help add more size, but still have a thin ring. Be careful though, because if you make the ring too long it can be uncomfortable. The same goes for too thick. A taller ring or longer ring is fine, but generally no more than an inch at the absolute most, with 3/4 inch being better. You can really thin down the walls of the ring with a taller blank, and it will hold together better. For the same reason you don’t want your ring too tall, you don’t want it to be too thick. A reaction to thin rings being weaker is to make a thicker ring so it’s stronger. This is a sound idea in principle, but wearing a 1/4 inch thick ring is painful. Stick to a wall thickness of about 1/8 inch, and you will be fine for comfort. The ring will not be too thick as to be uncomfortable, but it will also not be too thin as to be a too fragile to wear. This is a great size that works for a lot of rings. If you are really concerned with strength, and you want to solve it permanently, then put a metal core inside your ring. This can be as simple as a stainless steel core from Amazon for a dollar, or as nice as a gold band for several hundred dollars. The choice is yours, because you are making the ring. I have a metal band in My Wedding Ring, and it’s made from Titanium. This is a light weight, and relatively inexpensive material. All you do is drill your piece of wood so that the ring fits inside. Buy a ring with a flat exterior, and you won’t have to flatten it before gluing the wood in place. Once you have your blank with the metal ring epoxied inside, you follow your normal steps to create the ring shape. After you are done, you have the beauty of wood on the exterior, and the strength of metal on the interior. Most people give up on sanding way too soon. It’s sad, because a wooden ring is going to live for a very long time, and compared to that time, it only takes a blink of an eye to sand out all the imperfections. You are going to be asked a lot of questions about your ring. That’s the nature of wooden rings, people see them and they ask questions. The last thing you want to do is leave a bunch of scratches so people think you are a poor woodworker and you have a crappy ring. Spend another fifteen minutes sanding the ring, and see what it looks like. After that, if you are still not satisfied, spend another fifteen. It will not take long to get all of the scratches out, but you will be happy that you did every time someone asks you to see your handmade wooden ring. The Last 10% Principle explains this idea more, but your project is won or lost in the last ten percent of the time you spend on it. You can control the destiny of all of your projects if you focus on the end, and finish strong. Most of the time, new woodworkers use hand tools to make rings. This is normal, because in the beginning you probably don’t have many tools. However, if you do have access to a lathe, the ring making process can be a lot easier. A lathe is a great tool for making rings. All of the sanding, roughing out, and finishing can be done right on the machine, without moving the blank. It’s much faster, and much more accurate too. Your ring thickness will be perfect, and you will not have any shallow spots. Even a small lathe is great for making rings. There are also places that sell ring making bushings for a pen mandrel, or you can add a small chuck and pin jaws. Either way, once you make rings on the lathe, you will never make them any other way. 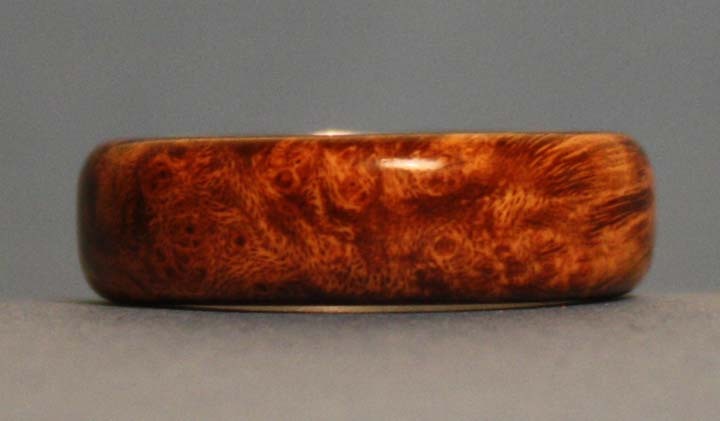 The final touch to your wooden ring is a great looking finish. Thankfully, this is easy to accomplish. 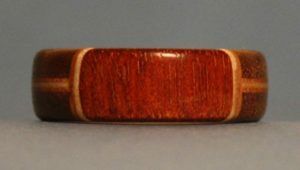 Any hand applied finish is perfect for the job, and if you can wipe finish with a rag, you are more than qualified to finish your ring. I wrote a 10 Step Guide to Wood Finishing that will teach you how to apply a hand finish like a champ. The process is very easy, and you can end up with a ring that looks so good you might not even want to wear it. 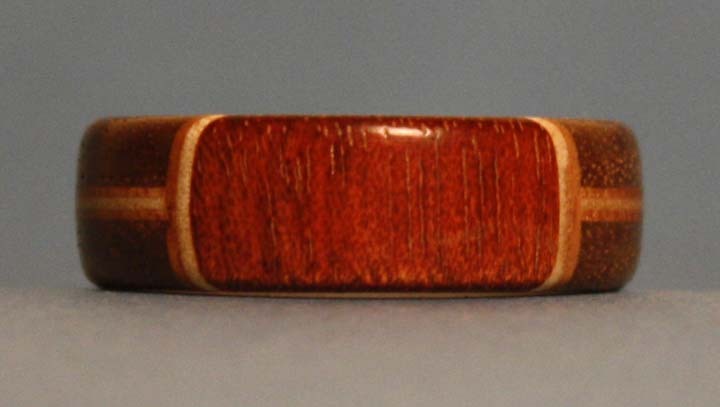 After applying the finish, find a place to set the ring while it cures. Give the ring enough time for the finish to fully cure before you wear it. Skipping this step can lead to premature damage to the finish, which is a waste of all the work you just did. Of all the finishes that are great for smaller items, buffing them on a wheel is by far the easiest and the fastest. You can go from raw wood to finished ring in about a minute, and you can handle the ring instantly afterwards. To see my buffing setup in action, take a look at How to Buff Wood to a High Sheen, and you can see the difference that buffing makes. Wood goes from dull to shiny and pretty in a matter of seconds. The system is not very expensive either, and they have a version for the lathe too. Once you finish your rings like this, you will not do it any other way. I waited too long to buy the Beall buffing kit, and I wish I didn’t. It makes applying a finish easy, and it also makes touching up an finish easy too. Just give it a quick buffing, and you are done. There you have them, the 35 tips on how to make a ring. I hope you found several ways to make better wooden rings from the list, and I hope that you incorporate some of them into your process. Making a ring is not a complicated woodworking project, and in fact just about anyone can make a ring they are proud of. The beauty if ring making is taking it farther, and making more and better rings every time you go into the shop. Use a variety of wood, more design options and more choice. Find a place online and a physical store that you can buy materials from. Use materials other than wood for your designs. 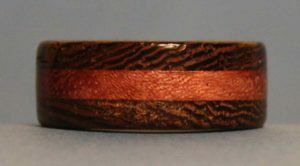 Look at an online wood turning site for ideas about different materials to use. Buy thin pieces of wood if you have very few tools. Make your own thin stock if you have more woodworking tools in your shop. Look online for inspiration and motivation by looking at wooden rings. Use wood lamination to show off different looks. Use layers of differing thicknesses to show more variety in your blanks. Incorporate veneer for really thin layers of color in your rings. Test all of your designs before gluing them, make sure there are no gaps. Align the grain perpendicular to each layer for strength. Use a brand name wood glue for all wood to wood joints. Leech oily woods with acetone before gluing them together. Use a brand name epoxy for gluing non-wood materials. Make a larger blank, it’s the same amount of work, and you get more rings. Drill the finger opening on a drill press if you can. Always clamp your blank when drilling to avoid injury. Use a Forstner bit for a cleaner hole with smoother sides. Have a scrap board under the blank to help control blow out. Size the ring well to ensure a good fit for the wearer. Sand inside the ring carefully, and break all rough edges. Use a Dremel tool inside the ring if you need to remove a lot of material. Try out a comfort fit, which makes a tighter ring feel bigger. Trim away as much excess as you can before sanding and shaping. A belt sander is great for roughing out the initial ring shape. Incorporate inlays into the design if you want. Sand through the grits to minimize sanding time. Don’t make the ring too thin, it won’t be strong enough. Don’t make the ring too thick, it will be uncomfortable to wear. Put a metal core inside your ring to combine strength and beauty. Sand until your ring is flawless, and don’t stop a moment sooner. Make your ring on the lathe if you can. Apply a great looking finish by hand. Buff the wood for your finish if you have access to a buffing setup. If you have made it with me this far, you have to be really excited about making a wooden ring yourself. Your homework is to get out into the shop and start making a ring. Include some of the tips you just learned, and make some sawdust. If you are completely new, head over to the wood store and look at materials. Tell the staff what you want to make and let them point you in a good direction. Bring home some materials and give it a try. You will be pleased at how fun and easy the project is. When you are done, please email me and send me some pictures of your finished rings. I would really like to see them. It always makes me happy to see that I can help you make a project that you enjoy.